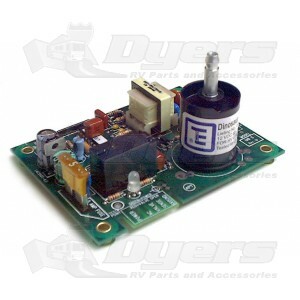 Works in any furnace, refrigerator or water heater that uses a standard ignitor board. A fuse on the board protects the board against short circuit damage. A handy diagnostic light on the board is green to show power to the board and red to indicate power to the gas valve. For 12 VDC applications only. Use a see-thru plastic cover when installing these boards in a water heater or refrigerator. Dometic and Norcold refrigerators. Use in Coleman, Duo-Therm, Hydro-Flame and Suburban furnaces. Use in Atwood, Mor-Flo or Suburban water heaters. Post for convenience (spark plug top). Removable jumper for Instant fire operation in water heaters and refrigerators. Post connectors for the spark lead.